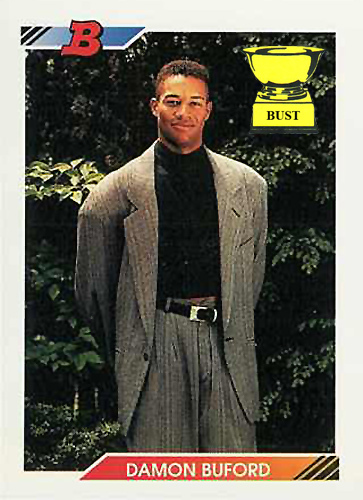 Today's fashion model: Today we have Damon Buford, a center fielder who might have a few holes in his swing, but doesn't have any in his wardrobe. Damon is looking dapper, wearing a suit that he made himself out of the drapes from his parents' bedroom. Even repurposed, those curtains still hang elegantly. Damon scoffs at the notion that belts need to be "tight" or "hold things up." Instead, he has taken an airplane seat belt and wrapped it nonchalantly around his waist. Touché! And Damon's brand new black mock-turtleneck completes his look, which resembles something a not-very-talented jazz musician might wear. With this much style, there's no doubt that Damon is "da man." I'm glad these are back. So many fashion gems in that set. We really should consider doing these more often. So amazing.